This is the story of the development of St. Paul Evangelical Lutheran Church located at Clinton and Arabella Streets in Defiance, Ohio. In the year 1867 a few members of St. John Lutheran Church, Wayne Avenue, Defiance, Ohio, became discontented. In February 1870 arbitrators, the Revs. Mr. Sibler and Mr. Strubnatzi of Fort Wayne, failed to obtain favorable results. Therefore, the dissatisfied separated from St. John German Lutheran Church. This separation was in consequence of synodical differences between the Buffalo and Missouri Synods, who differed chiefly in the doctrine of ministry and church. The Iowa Synod attempted to stand for conciliation and tolerance, especially when a very stark doctrine of Predestination was hurled into the controversy. The mediated position of the Iowa Synod appealed to the group, who could see nothing in the predestination theory but to return to Dortrecht, and so on November 7, 1870, under the chairmanship of Rev. Mr. Kroenecke of Riga, Michigan. 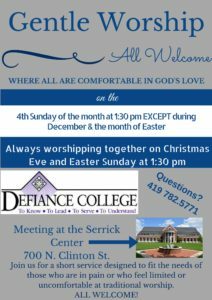 The St. Paul Evangelical Lutheran Church, Defiance, Ohio was organized. There were twenty-four members present. The first church council elected by ballot was: Deacons: Wilhelm Dannenberg, C. Krull, and Friedrich Wolfrum (Secretary), and as Trustees- Adam Behringer, Andreas Martin (Treasurer), and John Schultz. A ballot vote resulted in a call being sent to the Rev. John Deindoerfer to be the pastor. Many resolutions were passed; the trustees were instructed to procure building lots, find a suitable dwelling for the pastor, etc. All this organization completed at this November 7, 1870 meeting indicated that the congregation was starting with property. The congregation rented for $70 and first worshiped in the small Universalist Church located at 319 Washington Ave. Defiance, which later became the Church of the Brethren. Here they were until November 1, 1871. Soon after its organization, the congregation purchased three lots on the corner of Clinton and Arabella Streets, in front of the Union School Park, from H. C. Bouton. The cost of $1,200 was to be met in three installments. Many members furnished lumber for the building project. They then erected a small frame building at the rear of the corner lot facing Arabella Street for the purpose of a parochial school. The building was used for Primary Sunday School and Society purposes until our present Parish Hall was built in 1936. It was then sold for $100 to Mr. Sullinger, who used it as the core of his home, which he built at 319 East High Street. A house for the pastor was rented at $10 a month. On May 15, 1871, C. J. Johnson’s plans “for the building on the corner of Clinton and Arabella Streets were submitted for approval and were accepted. The edifice, a solid brick building, 36×60 feet, with a spire in front about ninety feet high, cost about $6,000. The cornerstone was laid the summer of 1871. The money for this building was to be borrowed. The plan for the windows was changed to colored art glass and arched openings. The story is told that the fund for these windows was started by the men at the meeting emptying their pockets of money they had with them. One man gave all he had with him, although he was afraid to tell his wife about it. The Lord always provides for us! On the way home that night he found exactly seventy-five cents, so could meet his wife joyfully. This was Helmuth Jaeger. The finished church and steeple cost $6,314.33. The steeple cost $300. A well was dug in 1871. The first pastor was the Rev. Johannes Deindoerfer. He was a native of Bavaria, Germany, graduated in Theology at Nuremburg and was ordained at Hamburg, Germany. He came to the United States in 1851 and settled in Saginaw, Michigan. He was one of the organizers of the German Lutheran Synod of Iowa and other states (Eastern District). In 1865 he took charge of St. John Lutheran Church in Toledo, Ohio. He then accepted the call to St. Paul Ev. Lutheran Church, December 20, 1870 and was installed as pastor January 8, 1871. He remained as pastor until March 1889, when he left to accept a call to Blissfield, Michigan. He was an earnest, conscientious man who directed the church commendably. The first baptisms in 1870 were August 28, 1870- Friedrich Jaeger, born August 26, 1870, son of Helmuth and Sophia Jaeger and August 28, 1870- Charlotte Louise Koenig, born July 17, 1870 daughter of Albert Koenig, and November 6, 1870- Otto Wrede, born September 28, 1870, son of Adolph and Ann Wrede. The children comprising the first Confirmation Class confirmed on “Quasimodogenite” 1871 were: Carl Behringer, Herman Biede, Henrich Kammeyer, Ernst Kefsler, Theodor Kefsler, Maria Schultz, Wilhelm Schultz, and Carl Trampe. The first marriage was performed January 14, 1871 when Frederick Donnenberg and Maria Martin plighted troth. When the church was dedicated in February 1872 there were “140 communicants and of their families and other members about 250 souls.” There were spiritual and active members who were entitled to use the means of grace but could not vote, and such as could do both. To become a spiritual member one had to apply to the pastor for examination and recommendation. The voting members were accepted by ballot in a regular congregational business meeting. In 1873 the first parsonage was built to the north of the church where the present church stands. This parsonage is in use today as it stands on Clinton Street across Monumental Park from our church. A bell was cast in Germany arrived in Defiance via the Wabash Railroad. Helmuth Jaeger brought it in a spring wagon from the railroad to the church property. It was placed in the belfry in 1883. The bell’s clear tones called many to worship and tolled the age of the person when the Lord called him to enter his heavenly home. Today this bell still calls for worship and tolls for the departed. A spire about ninety feet high was added to the church in 1891. Later, October 2, 1934, the weather vane was removed and a $100 copper cross ( a donation from H. B. Tenzer) was placed on the spire. The first congregational meeting was held in November 1870. Pastor Kranecke assisted in the organization. It was voted to call the Rev. Deindoerfer to be minister and teacher. He was to receive a yearly salary of $500 and a house rent free. It was also voted that the Rev. Deindoerfer should be president, Mr. Wolf, secretary, and Mr. Martin, treasurer of the congregation. All reports were kept in German. The young people were to attend church more often. It was the custom for many years, yes, perhaps as late as 1915, for the men to all sit on the left side of the church and the women to all sit on the right side. The Ladies Aid was helpful to the church. In 1889 they purchased an altar parament from Nuremburg, Germany for $59 plus 70 cents express charges. This was black felt, beautifully hand embroidered in white, depicting the sacrifice of Isaac by his father Abraham. This was always used at the Good Friday and Funeral services. At first an organ was rented. Then in 1896 the Ladies Aid bought a pipe organ for $630; $200 of which was given by the church. This organ was dedicated February 23, 1896. This was strictly a church having only German services, but a need for English services arose. Therefore on August 12, 1891 was begun the alternating of the German and English service in the mornings and evenings. The Rev. J. F. Lorch of Chenoa, Illinois was called in September and installed October 27, 1918. Some new things initiated in 1918 were the annual mission festival held in Latty’s Grove (Now called Veteran’s Memorial Park), communion services, namely for the English being held on Maundy Thursday, Pentecost, the first Sunday in October and Christmas, and for the German on Easter, Trinity Sunday, Reformation and the first of the Christmas services; Lenten services, and a special synodical collection taken at the door. Innovation varied in 1919. The women were granted the right to vote if they were 18 years of age and were contributors. This January 6th decision meant much to the church for more women attended than men. Also, at this time it was decided that if a deceased person was a lodge member he could be buried from the church but there was to be no lodge service. A new parsonage was built in 1919, the old parsonage was sold for $400. Summer School was started with the pastor as the teacher. It was held 3 hours in the morning, for 4 days a week for 6 weeks, beginning when schools began their vacations. The pupils were treated at the end of the period. Ushering began in February 1919, when the men worked in teams of 2. The first Sunday school board was appointed in April of 1919. On September 29, 1919 it was voted to have a homecoming for the boys who had served in World War I. A service flag with a star representing each boy and the American flag were proudly displayed in our church. A banquet the price being 25 cents was planned for the second Sunday in October. The jubilee year for the church was 1920. The budget was $2,365, the pastor’s salary was increased to $1,500 and the organist’s salary increased to $180. On Pentecost, May 5, 1920 reunions of the former Catechumens were held. The Ladies Bible Class donated individual communion cups June 2, 1920. These were used at the English services and the common chalice at the German service. The Rev. Lorch resigned November 20, 1921. The Rev. Theodore Strauss filled the pulpit while there was no pastor. Then he was called to serve as pastor with $1,500 as his salary. Improvements were always being made. January 22, 1922 English services were held every Sunday and at 11:00 a.m. every other Sunday the German services were held. June 8, 1922 the high pulpit was removed from the church. In 1934, it was thought that a reception committee at the church door would let people know that we are a friendly people. Miss Wilhelmina Gherke offered her services. Mrs. Mary S. Tenzer was a life member of St. Paul, her father was one of the founders of the church, Frederick Schultz. She had been a Sunday school teacher for many years and felt there was a need of a Parish Hall to be used for classes. She tried to influence her husband to give a sum of money for that purpose. She never realized her dream, but in 1935 the year following her passing, her husband gave a gift of $30,000, given in remembrance of his “beloved wife, the late Mary Tenzer and himself” to be used to build a parish hall. The parish hall was built by Baker and Shindler Contracting Company as designed by Merritt and Cole. The hall provided individual classrooms varying in capacity upwards to forty pupils. The auditorium, with a seating capacity of over 300, includes a stage with dressing rooms and a movie projector booth. The basement interior with its walls of beautiful glazed brick provides a kitchen and a combination dining room and social room in which the fireplace gives a suitable setting for organization activities. 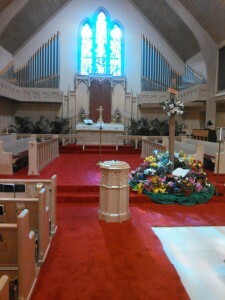 At this time the new chancel was added to the former church auditorium thus increasing the seating capacity. The church was completely renovated and redecorated. The church bell, pipe organ, pews and windows were retained from the old equipment. The parish hall was dedicated on April 11, 1937, Easter Sunday. With special services held every night that week. On May 14, 1944, the Rev. G. F. Shoup was installed as pastor of St. Paul. At this time, the congregation numbered 425 souls, 315 were communed members. 54 sons of the congregation were in their country’s service, 2 having paid the supreme sacrifice. During the celebration of the 75th anniversary of the church, there was a ceremony to burn the mortgage of the parish hall.